I have been searching relentlessly for a deodorant/anti-perspirant that does NOT have any of the toxic chemicals in it, such as parabens, aluminum, etc. Until now, I have not had any luck in finding any non-toxic deodorant that actually works. So I found a recipe, altered it a little with trial and error, and I’m glad to report that it works great! I think the secret to this recipe is the probiotics added to the formula which are good bacteria that will kill the bad bacteria that is causing the odor from under your arms. Combine coconut oil, shea butter, and beeswax in a quart size glass mason jar with a lid. Place this in a small saucepan of boiling water until melted. Swish around the glass jar periodically to stir ingredients. 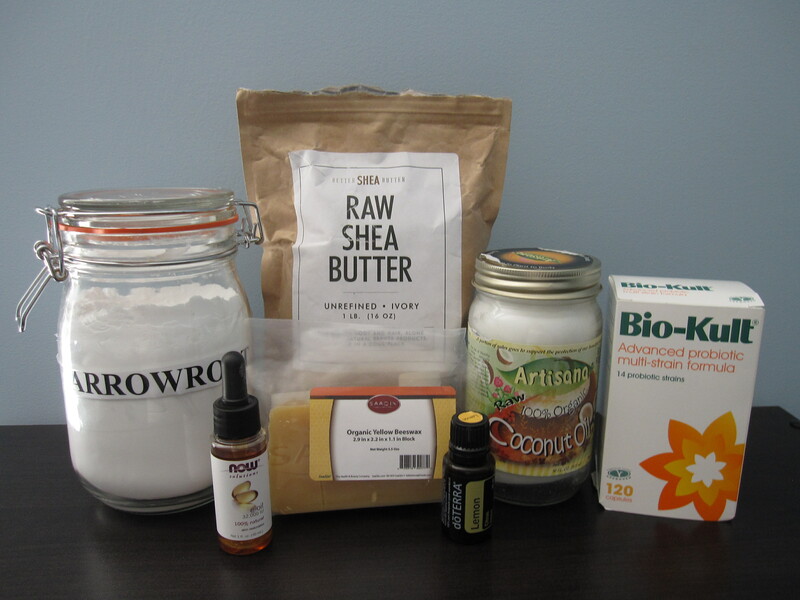 Remove jar from heat and add vitamin E, arrowroot, and probiotics. Make sure the mixture is not hot to the touch (warm is okay) so that the heat does not kill the probiotics. Gently stir by hand until all ingredients are incorporated. Let mixture harden for about 20 minutes at room temperature to the consistency of peanut butter, and use a spoon to scoop it into an old deodorant container or glass jar. Then leave the cap or lid off overnight to harden it further. Place about 2-3 drops of lemon essential oil on top of the deodorant mixture, making sure it is distributed evenly on top, covering the mixture. Do NOT mix the lemon oil in it. * Makes approximately 4.5 oz. Amazon’s prices are usually better than most companies, and they ship really fast. If you would like to purchase these items, please click on the pictures below to take you directly to the site. By using these links, it helps me out by Amazon paying me a little for promoting these products. It will not cost you extra money. And you know me… I only promote products that I truly believe in.